When I lived in Japan as a 19 year old, I greatly missed home (and American food) for the first few weeks there. I suppose that’s natural. They say you often lose weight when you first arrive at a culture with a vastly different diet than your own, and then as soon as you get used to how great the food is, you gain weight. Well, I eventually learned to make miso soup and fish heads staples in my diet. I even tried some raw chicken (a delicacy), but my weight gain was not because I was putting down the healthy fish, rice, and tofu. It was more the result of having found some European bakeries and a little cafe tucked away within walking distance of my college campus. On the menu at that little cafe were banana crêpes and mint milkshakes. Yeah, it was all over at that point. They had me at crêpe and milkshake. I certainly love those flavors and food items. And I knew having one of each was such a teenage-metabolism thing to do, but I was drawn to the comfort of foods I would find at home. I needed something non-fishy and non-red-bean to bring me some home—some familiar. And I’d like to tell you that I exercised self-control, but the truth is: I went every day after class for two weeks and ordered both until my stomach literally hurt. It’s what made me realize I needed to stop, get a grip, cease pretending to be somewhere I wasn’t, and live in the present. I feel this way about holding onto the past in general. I sometimes want to go back to when this or that relationship was better, this child wasn’t struggling, that financial stress wasn’t weighing down on us, we didn’t have XYZ problem, life was simpler, etc. Do you ever feel that way? As if, somehow, transporting ourselves back to that time and place erases all worry and stress? It really doesn’t. We just end up trading in current wisdom for a time when we hadn’t learned certain lessons yet or experienced particular deepening, strengthening trials. For every relationship we look back to a better day, there are those that are now healed and stronger. For every trouble squeezing our heart now, going back in time just finds us another one and we’d have to go through it all over again. As much as I miss holding my infants, I can still hold other people’s and savor the memories. “He has made everything beautiful in its time” means that even our oldest pain, deepest struggle, past regret, biggest learning curve, etc.—when yielded to Him—can be made beautiful, can be turned around, can be given new life. What’s more: “He has put eternity into man’s heart.” The longing we feel is not really nostalgia in the sense we understand it. It’s a timeless ache that can only be filled with relationship with God, that, thanks to the redeeming work of Christ on the cross, we can have forever. We often want something comfortable, familiar, and from another time and place because we rely on memories and a time gone by to inform our hearts. I challenge us to ask God to help us live in the present: fully engaged in what is happening now, learning from what came before, and knowing that with “all things new” and “working together for good” when we trust in Christ, we can see the past as reassurance that we come through things, we can heal, hope is ready, and the lessons of yesterday are the growth needed for today. *It is a widely held belief that King Solomon authored Ecclesiastes. For a great book with a heavenly perspective, refer to You and Me Forever: Marriage in Light of Eternity by Francis and Lisa Chan. 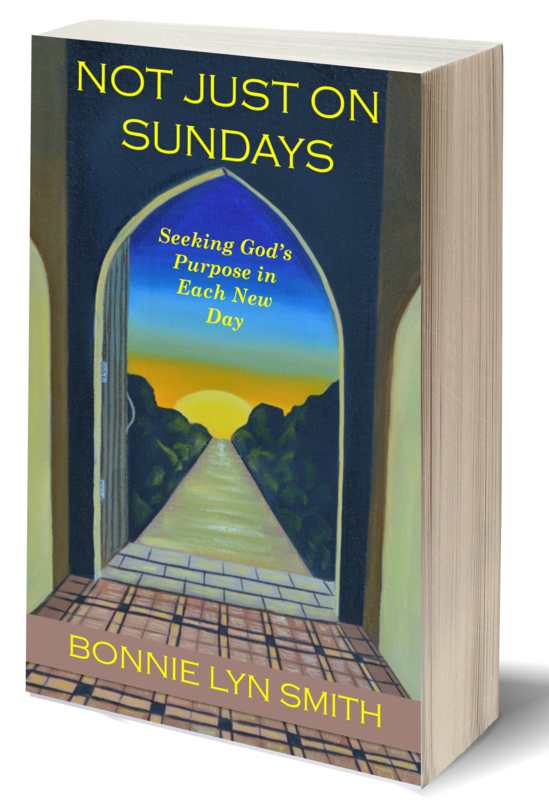 For more anecdotal stories with direct application of what the Bible teaches about relationships (with God and others), healthy boundaries, grace, childrearing, joy and peace in the storms of life, and many other topics, refer to Not Just on Sundays: Seeking God’s Purpose in Each New Day. This blog has been shared at RaRa Link-Up, Tell It To Me Tuesdays, and Mom 2 Mom Monday Link-Up. Bonnie, this really hit home for me. I do find myself “living in the past” more often than I would like. I REALLY want to be more in the present, because, when you get down to it, that is really all we have. Somehow I think humans tend to “sugar coat” the past. The future hasn’t happened yet. We need to “live in the moment!” I think that is why I am so passionate about dogs. They TRULY live in the moment & enjoy, that time, right then! Thanks, Deb! I agree with you. The dogs are some of the best inspiration for this, and they came into our lives at just the right moments! 🙂 I think we do sugarcoat and forget the hard lessons along the way that make us stronger and wiser. Part of laying my anxiety down at the cross is accepting that God can handle my past, present, and future, so if I trust that, truly, why am I twitching? These are the questions in my head as I wake up each day. LOL. Actually I have been doing a lot of looking back in my life because I did not have the problems that I have now. I know I have got to depend on the Lord to get me through my troubles and I have been praying a lot. You are right, I have to get Him to help me embrace the present. I must trust Him to carry me through this. Mary, praying we can each do this. I think you hit on something so true that when we are in a season of great struggle, looking back is sometimes so appealing. And I do think reflections can be helpful at times. Praying for His strength, grace, and wisdom in your current struggles. Thanks, Amy Lynne. That’s such a kind endorsement!